Her smile was as dazzling as the roses she raised. GaNell Durfey was born to raise and nurture anything flora. A 1935 graduate of Cardington High School, she was raised on a farm but her floral talent became evident later. She was a member of the Cardington Garden Club and following the 1981 tornado she and the talented committee members of the Beautification Committee brought beauty where there had been destruction. Durfey was hailed as the guiding force with the other committee members in filling 53 half barrels in Cardington’s business section with flowers and plants that bloomed from spring through fall. Except for 11 years when she and her husband, Willard Durfey, lived in Lakeside and German Village, she lived her entire life in Cardington. Her gardens in German Village were on the village tour and she had gardens at Lakeside. GaNell’s daughter, Duanna Ullom, said at one time, her mother had 100 rose bushes in her garden in Cardington. Her mother loved that flower. Her floral ability was recognized with many honors including being named Morrow County’s Outstanding Senior Citizen in 1984. Among the many other honors was recognition as the most outstanding person in the 15th Masonic nine county district and recognition as a Friend of Education by the North Central Ohio Education Association. At one time she shared her expertise in landscaping at both the local elementary and high school buildings, volunteering her help in carrying out the projects. Her generosity in the donation of her flower creations to banquets, receptions, parties, individuals, churches and others made her name synonymous with floral philanthropy. 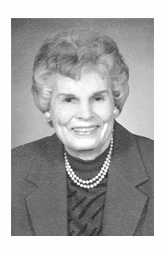 She gave generously of her time, talents and other assistance to students, the school and community. In memory of Bud Ullom, her first husband and Willard Durfey, her second husband, and son Phillip, deceased, she began awarding three Burr Farms Scholarships to Cardington-Lincoln High School graduates in 1983. a project continued lovingly today by her daughter and son, Gillbert. 70 years ago, 1949: Passenger train service out of Cardington was reduced by the New York Central Railroad to one train each way daily except Sunday when there would be no passenger service of any kind An Endowment Plan was established for the Glendale Cemetery. The article detailed the plan which included the raising of charges for cemetery projects.Board members were E. L. James, F. F. Welch and Walter Long. 60 years ago, April, 1959: The Public Utilities Commission of Ohio recommended that the Cardington train station be closed. The depot was closed April 30, 1959. Irwin and Alfred Holt returned to Cardington from spending the winter in Florida.